Most of the time when we think about having beautiful skin to show the world, we think about our faces. But with the warmer temperatures, suddenly we’re baring a lot more skin as we swap out the long-sleeved shirts and jeans for shorts, capris, and tank tops. Is your skin ready for that? Or are you seeing dry spots, flaky skin, dullness, calluses, and an overall lack of radiance? If you fit into the latter camp, it’s time to take action. All you need is a dry skin brush. You may have heard of it, this idea of taking to your skin with a dry brush. People have been doing it for centuries. The Japanese used loofah sponges to brush the skin vigorously before hot baths. Ancient Greeks were known to use skin scrapers to get the skin clean and increase circulation. Native Americans used dried corn cobs and sand from river bottoms to scrub and clean the skin. Today, many of us are so busy in our daily lives that we have little time to pay attention to our body skin. We wash, dry, and run out the door. Hopefully, we apply a little moisturizer first. During the cold winter months, our skin tends to suffer under harsh weather conditions, dry heated air, hot water cleansing, and lack of tender care. When spring and summer come around and we want to wear those skin-baring fashions, suddenly we realize the fix we’re in. Dry skin brushing is a simple method of invigorating the body skin with a soft brush. The best time is right before your shower or bath, so that you can wash off the skin afterwards. Start with a soft, dry brush made specifically for dry skin brushing. Other brushes may be too hard or harsh, and could cause micro-tears in the skin that can lead to acne, wounds, and infection. Use circular motions from the neck to the torso, and from the toes up, always moving toward the heart. Practitioners also suggest going from left to right over the stomach to follow the natural digestive path. Apply even pressure. Your skin should turn a light red, but you should not feel pain or irritation. You can use more pressure on thicker areas of skin, such as those that are on the heels, elbows, and knees. Use less pressure on sensitive areas like the underarms, stomach, inside of the thighs, and neck. It’s best for women to avoid brushing the breasts. Brush the entire body this way. The process should take about 3-5 minutes. Hop into the shower or bath to wash skin clean. Be sure to apply a deep moisturizer when you get out! There are a lot of great dry skin brushes out there today. Most use natural rather than synthetic fibers, and several have longer handles to help you reach your back and feet. You can choose the one that you like best. If you try one and the brush seems too hard, don’t continue! Look for one that’s a bit softer to get started with. You may even want to try a massage mitt if that’s easier. First up, it definitely feels great! When you try it, you’ll see what we mean. There’s nothing like that all over zing that dry brushing gives you, a sort of invigorating scrub that rejuvenates the whole body. If you follow it up with a great moisturizer, your skin will likely tingle for awhile afterwards, giving you an extra spring in your step. This effect is why many practitioners recommend you dry brush in the morning, rather than at night, as it could keep you awake! There are some other beneficial effects. First, we know that it helps increase circulation, which is always a good thing. Getting that blood moving helps flush out impurities and brings important nutrients to the skin where it needs them. Many people consider dry brushing as part of their daily detox regimen, since waste-removing lymph vessels lie just below the outer layer of skin. Increased circulation also helps increase radiance and glow, helping skin to show more vitality. Perhaps the most important benefit of dry brushing, though, is the exfoliation effect. We regularly exfoliate the skin on our faces, but typically body skin goes for months without any such treatment. Without exfoliation, over time, your skin appears dry, flaky, and dull. Starting a dry brushing routine after a long winter can help change your skin from lifeless and tired to alive and radiant. As you brush, you open the pores and wake up the skin. There are some other ways that dry skin brushing may be good for you. Some people also find it soothing in a Zen sort of way, sort of like meditation. As you brush, you’re taking five minutes to just give yourself some focused care, which is likely to be good for your outlook on any day, and may help to relieve some stress. Use it every time before you bathe. We can all spare 3-5 minutes. Start at the feet, use circular motions, and brush up toward the heart. Midway, change to the neck and brush down. You don’t have to worry about getting it perfect. Just brush, enjoy the stimulation, and then shower. Pat dry, and apply moisturizer (or body oil) immediately. If you need to shave, brush first, and then shave—the brushing will help exfoliate and prepare the skin for shaving. If you burn your skin in the sun, lay off dry brushing for a few days until you start to peel. Then brush carefully, using less pressure than usual, to help remove flaking skin until you can go back to your regular routine. If you have time, take an Epsom salt bath after brushing. Your pores will be open, and it’s a great time to experience the muscle-relaxing benefits. 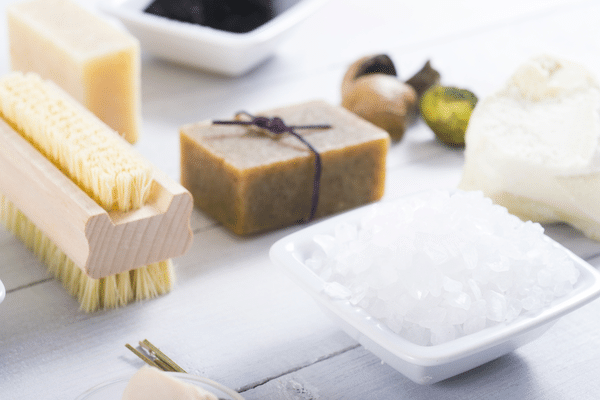 If you don’t have time to brush in the morning, feel free to do it at night—just follow with a warm bath and perhaps some relaxing essential oils to help counteract the energizing effects of the brushing. Drink plenty of water after brushing and cleansing to help encourage the detoxing effect. If you notice inflammation, lasting redness, itchy rashes, or other effects, you’re either brushing too hard or too often. Back off for a few days, then try again with a softer brush, or try brushing every other day. Have you tried dry brushing? What results have you noticed? People recommend dry brushing in the evening as it increases energy and regular blood flow. I love dry brushing and mention it quite a bit in my blog. I started last summer, and noticed that over the winter my skin was not as dry and flaky as it was in the past. I also feel it is stimulating so I always do it right before i get in the shower. Have heard it is good for circulation and lymphatic drainage. Obviously I have no way to measure that, but it is such an easy thing to do and feels so good. Once I started I couldn’t believe I had waited so long to try it! What about face dry brushing? Would you recommend it? You could dry brush on your face, but we usually suggest using an exfoliant like the Kaolin Micro Exfoliant! Ok! How often should I exfoliate the skin of my face? I dry brush my body daily, should I do the same with my face?